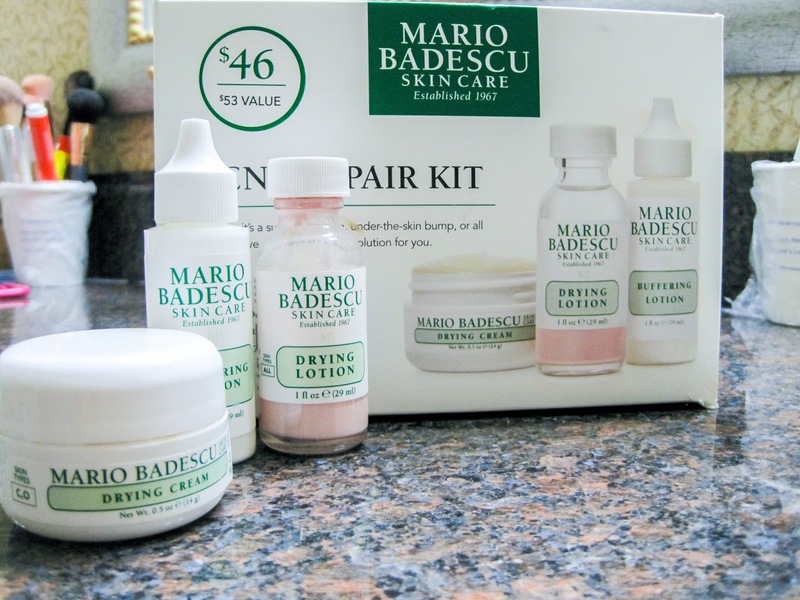 That was until I picked up this Mario Badescu kit at Ulta. I’ve heard great reviews on these products, but I never tried them for myself. This kit is retailed at $46 at Ulta. Since different breakouts require different treatments this one is specifically for under the skin problems versus pimples that have reached the surface. I decided to test them out on the first night and when I woke up the next morning I was SHOCKED to see how different my skin looked. I used the buffering lotion and then the drying cream and the next morning about 80% of the bumps on my face were gone. I had to throw extra cold water on my face to make sure I wasn’t delusional. I can’t believe the difference that just one use has made on my skin. 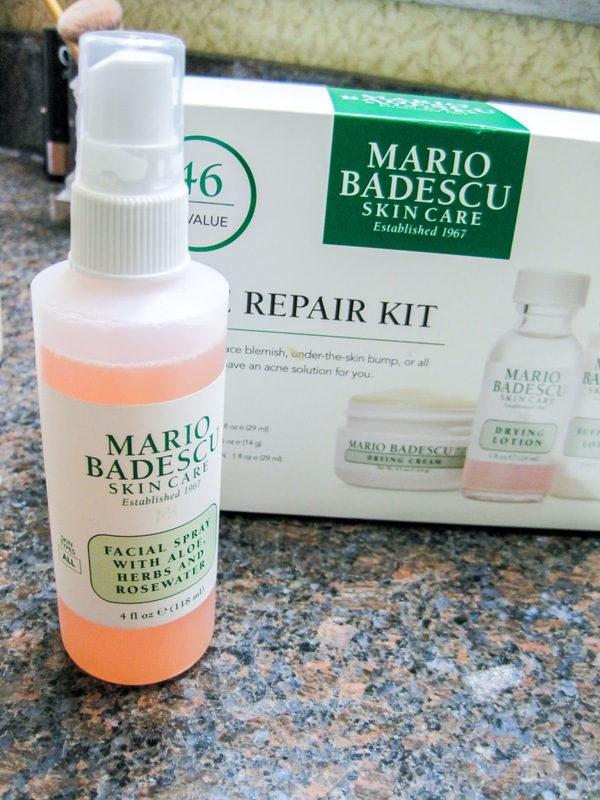 I also love the Mario Badescu Rosewater Spray. I use this instead of a face lotion because sometimes lotion can be too much for my skin and the Special Healing Powder helps my oily T-zone especially during the hot summer days. This is by far one of the most incredible skincare lines and products that I have used and have seen such a huge difference. I still use my normal skincare facewash from Rodan + Fields, but this is the extra products I have been using for the past month and I’m already planning on buying this kit again because it impacted my life that quickly! 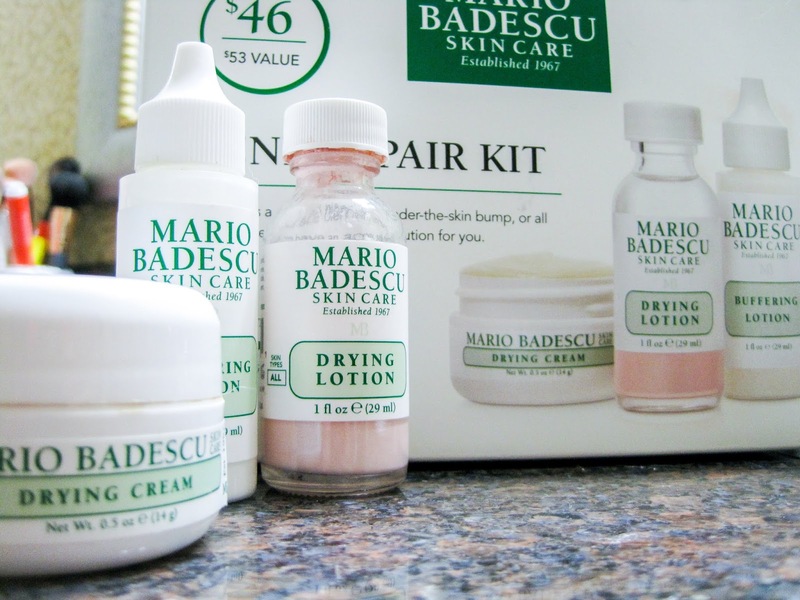 As usual, I added some FAQ’s and details about the products that I use from the Mario Badescu line down below. This fast-acting, effective spot treatment is specially formulated with Salicylic Acid, Sulfur, and Zinc Oxide to help draw impurities from the skin and target pesky pimples while you sleep. (Tip: Do not shake the bottle). Will this help to clear small tiny bumps on my forehead? Our Drying Lotion is best suited to spot treat whiteheads or breakouts with a white pus filled center. For small tiny bumps, we recommend the Anti Acne Serum overnight to help reduce congestion and small breakouts. What can I do if my product seems to have dried out? There is no more oil just dry pink paste at the bottom. Do I have to buy a new one? The Drying Lotion performs at its best when both the pink sediment and clear liquid are used together. When either one of these runs out - it is time to buy a new bottle. I have more blemishes and red pimples on my face. Can this product still work for those? Our Drying Lotion should only be used on whiteheads. For red/inflamed breakouts, the Drying Cream is a great option. To help reduce discoloration from previous breakouts, our Glycolic Foaming Cleanser can be used 1-2 times per week. What is the difference between the drying cream, drying lotion and buffering lotion? What are they each suited for and how should they be used? They are all spot treatments for different types of breakouts. You can use the Drying Lotion at night after cleansing, toning and moisturizing on whiteheads. Our Drying Cream can also be used overnight (after cleansing, toning and moisturizing) on red/inflamed bumps just under the surface of the skin. Our Buffering Lotion should be applied after cleansing and toning onto deep cystic acne breakouts - no serums or moisturizer should be used after using this product. This is a lightweight, quick-absorbing spot treatment specifically designed to target large, under-the-surface bumps. Specially formulated for troubled skin, Buffering Lotion works overnight to help reduce the appearance of existing bumps. Gentle ingredients (like Allantoin and Niacinamide) help normalize skin and improve the look of troubled areas. Is this product suitable for rosacea sufferers? This product is not recommended for those with very sensitive skin. How and when can i use buffering lotion and drying lotion? Both are spot treatments that should be used at night. Our Buffering Lotion should be applied after cleansing and toning directly onto deep under the surface breakouts. Serums and moisturizer should not be applied after this product. We recommend applying the Drying Lotion after cleansing, toning and moisturizing directly onto whiteheads. Spot treatment should not be layered. Since you can't put anything over this, Can you put this over other products (i.e. moisture or serums)? We recommend using the Buffering Lotion after cleansing and toning. It should not be used with or after moisturizer or serums. Can buffering lotion should be used directly after cleansing or after cleansing and toning? The Buffering Lotion should be shaken well before each application. Use every evening after cleansing and toning directly onto cystic acne breakouts. Do not apply anything over the Buffering Lotion (such as moisturizer or night cream). Do not use this as a preventative product; it should only be used when necessary on active blemishes. Should I use this spot treatment when I have no cystic acne? Or only when I have a cystic pimple? Our Buffering Lotion is not a preventative treatment. This should only be used to spot treat active cystic acne breakouts or bumps deep under the surface of the skin. Are you meant to pat/rub this is with your fingers, or just apply it directly and the leave it? The Buffering Lotion should be shaken before use and applied directly onto deep under the surface breakouts with clean fingers. We suggest applying this in a thin layer and gently patting into the skin. Our Drying Cream is specially designed to help shrink the appearance of pimples and small, under-the-surface bumps. This unique product is formulated with Sulfur and Zinc Oxide to clarify skin, drawing out pore-clogging impurities as a soothing blend of Aloe Vera, Biotin, Lemon Extract, Lysine, and Vitamins B and E helps ensure that skin remains balanced. Is this suitable for dry and sensitive skin? We recommend this for combination to oily skin, to be used sparingly on small bumps. It may be too drying for dry, sensitive skin. To help achieve (and maintain) a clearer-looking complexion, we recommend following a complete skin care regimen that includes a cleanser, toner, oil-free moisturizer, exfoliant and mask. Please feel free to give us a call at 1-800-BADESCU or LiveChat with us and we can discuss your skin and some options in more detail. The Drying Cream should be use sparingly directly onto red/inflamed bumps or breakouts just under the surface of the skin. It should not be applied to large areas. There is no way to guarantee something will not clog your pores. What is the difference between the drying cream and drying mask? Our Drying Mask can be used 2-3 times per week to clarify the skin and help reduce breakouts. This should be used on acne erupted areas only. Our DryingCream is a spot treatment, to be used overnight after cleansing, toning and moisturizing, on red/inflamed bumps or breakouts just under the surface of the skin. I have the drying cream, buffering lotion and anti acne serum. How are they all different? Can I use them at the same time? Or how should I use them separately? The Anti Acne Serum can be used at night after cleansing and toning and applied to large areas of breakouts. This will help reduce breakouts and congestion. Our Drying Cream and Buffering Lotion are for specific breakouts. The Drying Cream can be used to spot treat red/inflamed bumps just under the surface of the skin or small clusters of acne. Our Buffering Lotion is designed for very deep under the surface breakouts. 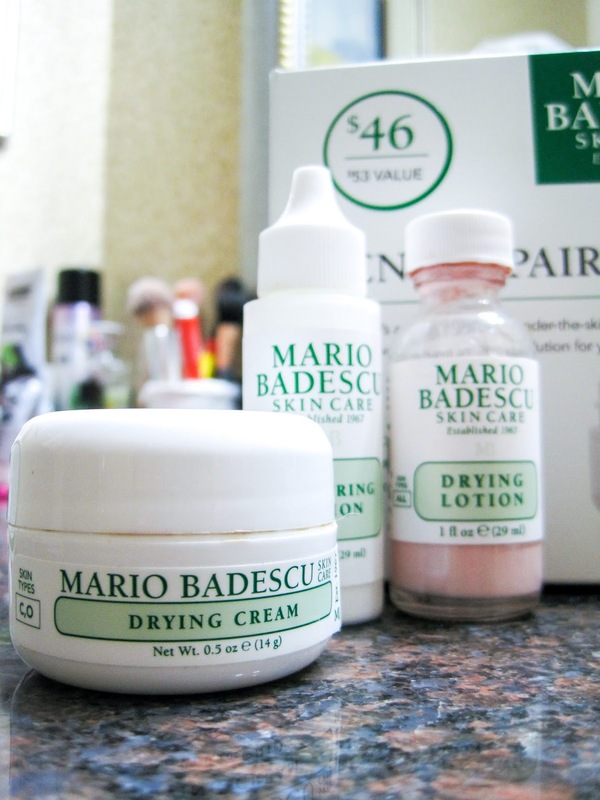 You may use the Drying Cream and Anti Acne Serum together. We do not suggest layering the Anti Acne Serum under the Buffering Lotion, as serums and moisturizers should not be used with this product. Do you use this product before or after toner? There are several ways you can use our facial sprays: -Boost hydration by misting evenly to cleansed, toned skin. Follow with your daily moisturizer or night cream. -Mist Facial Spray as a final step after makeup application to give your makeup a natural dewy finish. -Keep a bottle of Facial Spray handy to refresh your face during the day. -Use to moisten makeup brushes or sponges. Facial sprays do not take the place of toners though. Is this product just for your face or can you use it in your hair? You can use the Facial Sprays to help reduce fly aways or refresh your hair style. Our Facial Spray with Aloe, Herbs and Rosewater is oil free. Can you use this product as a setting spray? Our Facial Sprays are not designed to help promote the longevity of your makeup. They will provide a dewy, hydrated glow to the skin. What type of skin is this facial spray good for? Our classic facial spray is good for all skin types. It helps revive dehydrated skin with a floral infusion of Rose and antioxidant-rich Gardenia and boosts the complexion as Bladderwrack, a mineral-rich marine botanical, softens skin. Aloe soothes and Thyme promotes clarity—leaving skin radiant and re-energized. Fight unwanted shine. A blend of natural oil-absorbing ingredients like Sulfur, Kaolin, Zinc Oxide, and Calcium Carbonate helps clarify congested complexions so T-zone shine is kept under control. Pore-clogging buildup and impurities are drawn from the skin, leaving behind a clearer, smoother, and more balanced complexion. Is this powder supposed to be added before or after makeup? It can be used after applying your makeup onto oily areas of the skin. Our Special Healing Powder does not contain SPF. You can apply it using any type of dust brush. As I said, this trio has changed the game forever. I can’t even believe how quick of a turnaround I saw on my face after just one use. I highly recommend if you have cystic acne like I do that you run, not walk, RUN to Ulta and pick up this kit. You won’t regret it. 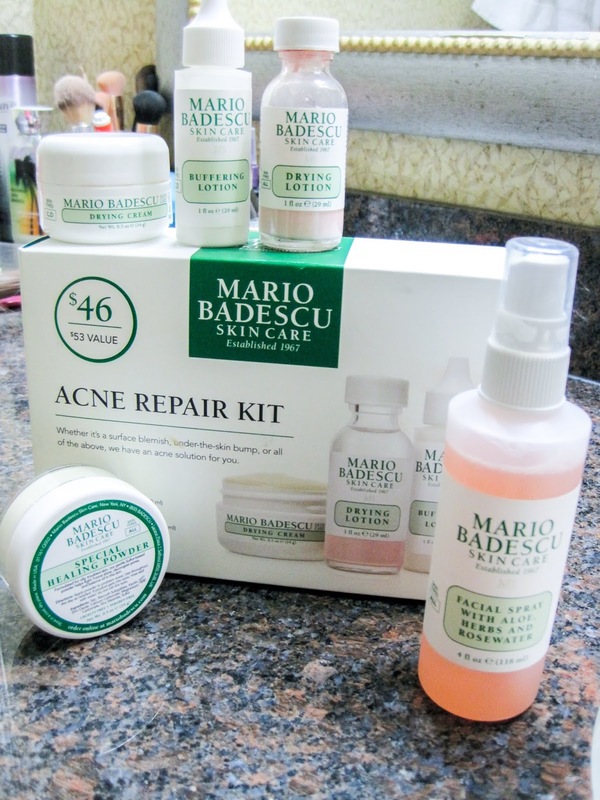 Do you have any other Mario Badescu products you recommend for me? Let me know by commenting down below.